Both MagicTree and Dradis are trying to solve the similar set of problems - managing penetration testing data and report generation. Both MagicTree and Dradis are allow importing the data produced by various penetration testing tools, allow the user add data manually and support report generation. Both MagicTree and Dradis store the data in a tree-like structure. That being said, there are significant differences between the two tools. 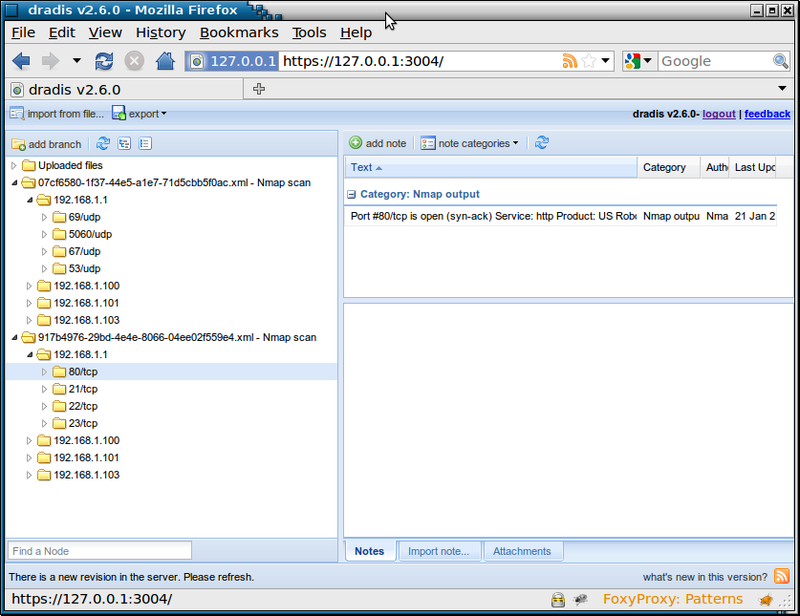 Dradis (version 2.6) is a web application. Older versions used to have a console client, but it has been discontinued. Dradis has a central server, where multiple clients connect. Thus it is possible for multiple testers to work on the same project instantly sharing the data they collect. If only one tester is working on a project using Dradis, he/she can run the Dradis server on his/her own computer. MagicTree is a classic desktop application. There is no server, no database and no listening sockets. MagicTree does not support instant data sharing the way Dradis does, but follows a different approach. At any point in time during the test, one tester can take the MagicTree project file created by someone else and merge it with his/her own, getting all the data obtained by the other tester. Though both MagicTree and Dradis store the data in a tree, there is a fundamental structural difference. Dradis puts the data in the tree according to its source. MagicTree structures the data according to the real-world object it describes. Let me explain that. The same goes for all data that gets merged in MagicTree, regardless of where it came from or what tool produced it. Any piece of data always appears under the object (host, port, service, etc.) it describes. This approach to storing data is fundamental to MagicTree and in particular allows querying of the data. I will describe the queries and other features build on top of that later in this article. Dradis is an open-source application written in Ruby. A user can modify and extend it any way he likes. Doing so obviously requires some knowledge of Ruby and the ability (and desire ;) ) to read and understand the existing Ruby code. In particular, if you want to extend Dradis to support importing data from some tool, you'll need to write an upload plugin. MagicTree is a closed-source application. However, it is possible for a user to extend it to be able to import data from tools it does not support out of the box. Two possibilities exist. If the tool you want to import data from produces XML output, you can write an XSLT transform and add it to MagicTree. The procedure for this is described here. You can use the XSLT files that come with MagicTree (in $HOME/.magictree/xslt directory) as an example. Alternatively, if the tool does not output XML or you don't feel like writing XSLTs, you can make a wrapper in any programming language you like that runs the tool, reads its output, parses it and outputs MagicTree XML that can be directly consumed by MagicTree. The MagicTree XML format structure and semantics are described here. Several sample scripts come with MagicTree and can be found in $HOME/.magictree/snippets directory. Dradis allows importing vulnerability descriptions from sources such as OSVDB and MediaWiki. This video demonstrates this feature. MagicTree currently does not do this, this feature is on our "to do" list. The second feature unique to MagicTree that I want to show here is command execution. It is tightly linked with queries, allowing the user to extract the necessary data from the tree and feed it to command-line tools (show query, launching multiple commands, remote execution, data import). The last thing I would like to show is MagicTree's approach to report generation. Any plans to add import NeXpose result functionality? If you use NeXpose, do you know if the XML for commercial versions is different from the free version? If you have a sample output and can send it to us, that will help. Just curious if a plugin to import NeXpose Community Edition is available? Nexpose let's you output in the Qualys XML formal. While this is not as good as a native transform will be, its a good stapgap for the time being.